I grew up in Oklahoma City, and looking back on it even in a land-locked city there were opportunities to sail, but I never had any exposure. In 2004, while living in Ann Arbor, MI, my wife Noemí and I took a trip to the lakeside town of Saugatuck-Douglas, and we were both enamored with the marina. We walked up and down observing the boats and wondering what the cruising life would be like. We visited a used book store, and Noemi bought me my first book by the famous maritime author Chapman. Later on, while living in Manlius, NY, Noemí and I lived on a lake, and while we only had kayaks, we still dreamed of sailing. 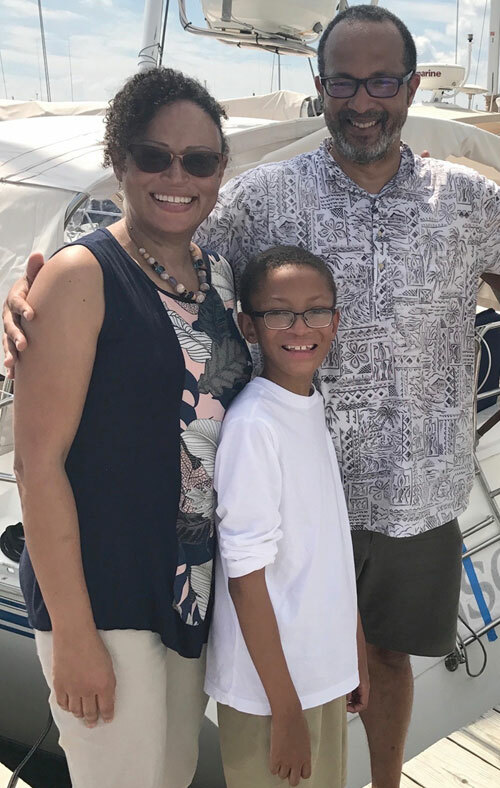 Over the years, I had taken several sailing lessons on Sunfish and small Hobie cats in the Caribbean, but as a couple our first major step toward sailing together was a cruise on the Schooner Woodwind in Annapolis. We loved it! Next we completed the ASA 102 Learn to Sail in a Weekend Basic Keelboat course at Annapolis Sailing School. The course was taught in the classroom and on 24-foot Rainbows. Afterward we chartered the same boats to gain more experience. About that time, we also went out on some short day sails with friends on a Seidelman 30 and with Start Sailing Now sailor Rodney Mitchell on a Morgan 38. 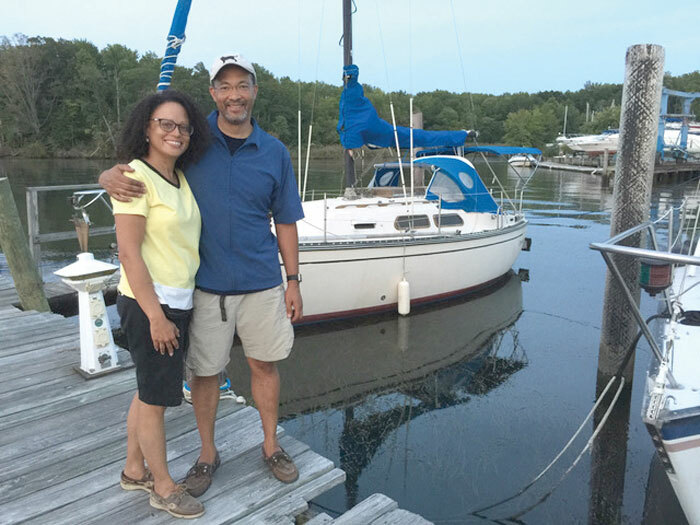 For the cruising life, I knew that we needed more exposure to auxiliary engines, roller furling sails, genoas, spinnakers, wheel steering, galleys, marine heads, berths, and other overnight coastal cruising skills, so we decided to buy a boat. In August 2015, we purchased Arcadia, a Paceship Yachts PY26. With that boat we gained tremendous experience sailing with our son Sean Manuel, other family, and friends. I also did some singlehanding and began crewing aboard Odyssey, a friend’s Jeanneau 41, where I was able to get my first blue water experience sailing from Annapolis to Boston in August 2016. In the summer of 2017, we sold Arcadia and purchased our second boat, Transcend, a Hunter Legend 40. This was a huge leap for us, but with more space, a cabin for our son, a larger sail package, and an autopilot and other features, this boat better positioned us for longer-term cruising and racing. Did you have any preconceived notions about sailing? I thought sailing would be a very complicated and knowledge-intensive sport, which would be prohibitively expensive to learn and pursue. Sailing is knowledge-intensive, but that is one of the aspects of sailing that has hooked me so completely. I will never master this body of knowledge, and that keeps me challenged and engaged. Although sailing can be expensive, there are many relatively inexpensive ways to get into sailing. Many smaller or older sailboats are less expensive than you might imagine. Also, some marinas are much more affordable than others. We plan to continue getting as much coastal cruising experience as possible, sailing with the Seafarers Yacht Club of Annapolis, the Universal Sailing Club, and participating actively with the Chesapeake Regional Accessible Boating community and racing program. Other intermediate stretch goals include gaining more experience with nighttime sailing, singlehanding, longer coastal cruises, casual racing, and joining a local rally. I would like to complete the DelMarVa, and to re-create on Transcend a cruise to NYC and Boston that I did on Odyssey. What would you tell someone interested in learning to sail? Get started now! Learning enough of the basics to get started is pretty straightforward. Read as much as possible (Chapman Guide, Annapolis Book of Seamanship, ASA Keel Boat), but you have to put the concepts into practice. 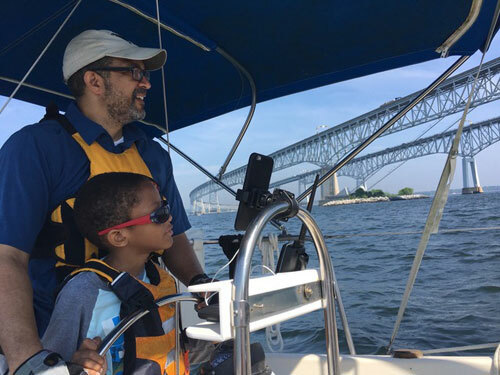 Sailing schools like the Annapolis Sailing School recognize this by combining both theoretical knowledge and hands-on learning. Initially, when one embraces the sailing lifestyle, there are many questions: types of boats, how to choose a surveyor (what is a surveyor, and should you use one), how to purchase a boat, new versus brokerage boats, what size, where to keep it, and more. Finding answers was an initial barrier for us, but we were pleased to have two boating communities on which we could draw very early on. The first was the Universal Sailing Club, and the second was the Seafarers Yacht Club in Annapolis. They have been a continuous source of information and answers. I am also very active in joining and monitoring relevant Facebook groups, and following a wide variety of sailing bloggers and YouTubers.